Measurements: 2.78 x 4.5 inches, or 70 x 114 mm. Back of card: White border, black frame, enclosing a yellowish/parchment field. On the field what looks rather like a Navajo/Hopi rug design drawn with simple black lines: strong diagonals, a diamond shape in the center, lots of short arrows butted perpendicularly against the diagonals. The black linework is symmetrical & though the background color is not quite, these cards can easily be inverted. Since this isn't a Native American deck, my guess for the design might be ancient cultural links between Arctic natives. Booklet included: Yes, 24 pages, 2.7 x 4.25 inches, or 68 x 108 mm. Comments: Based, of course, on the Finnish legend, the Kalevala. The epic itself was collected & compiled from 65,000 separate poems by Elias Lonnrot, from 1830-1840. He walked some 20,000 km throughout the Scandinavian countries. The Kalevala is about two warring tribes: The Good Guys Kalevala tribe and the Bad Guys Pohjola tribe. The booklet outlines the basics of the epic. 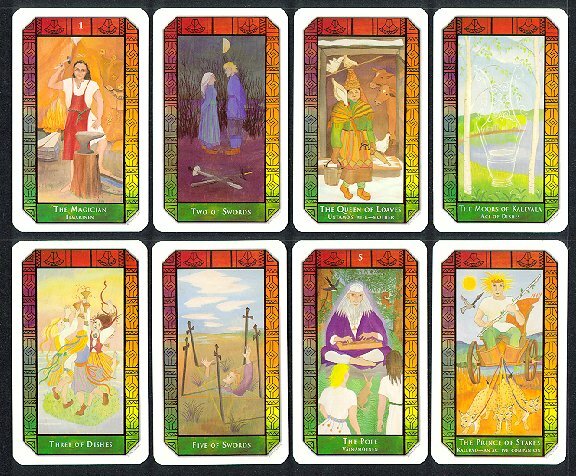 In this deck, the suits are Stakes, Swords, Dishes & Loaves. Court cards are King, Queen, Prince & Princess. Court cards, aces & major arcana each have the name of a character from the epic. Vainamoinen is the central character & from his belt the major arcana are derived. The Falling Tower: A strange coincidence reveals the truth. Reversed: This is the moment of truth. The Lovers: You have two alternatives. Reversed: Not choosing is still choosing. The Hanged Man: Things are as they seem. Reversed: You need to be clear about the possibilities available. Ten of Swords: The fight will soon be over. Reversed: At times you just have to accept what has happened. Wish these pithy definitions were more readily to hand!